Week 5 went nothing like I had originally planned. Some of that can be blamed on the weather, the matchups, and just my mood in general. With no real intriguing Thursday games aside from Parma or Pittsburgh, my wife and I opted to head to Cleveland for the Browns game. It’d been over two years since my last Browns game. Having a 2 year old daughter made the choice easy to give up my season seats. But, seeing that tickets were fairly cheap on Ticketmaster meant the idea of heading to Cleveland worthwhile. Before the game, we stopped at Texas de Brazil for dinner. A dining experience anyone should try at least once. After that, we decided to test RTA’s ability to quickly, and cheaply, move you into town for the Browns games. Pre-game, everything worked great. Parking in Shaker Heights, we were at the stadium in a half hour, nearly the same time as driving. And dumped off right at the southwest corner of the stadium. All for $5.50 a person for the all-day pass. After the game, however, was where the headaches began. First, the game ended before midnight. RTA advertises they’ll run the trains until an hour after the game is over. By the time you get to the West 3rd stop, we waited over an hour for the next train. A blue line. We were told the next one would be the green line. And we waited. And waited. Those expecting a transfer at Tower City were told there would be no transfers. This was the last train running. So, everyone heading west on the Red Line were SOL. Some customer service. Finally, the last green line train arrived to pick up the stragglers. Then, a half hour ride to our car. A 90 minute ride to my parents to pick up our daughter. And an hour drive home. Arriving home at 5:30 on a Friday morning after a game is not exactly optimal. Luckily, we both could sleep in. But, then it was up for Friday night and impending weather. Games across the region were either moved up, moved back, or rescheduled for Saturday. This put a huge wrench in my plans. Knoch-Ambridge was my original plan, but I wasn’t looking forward to a one-sided matchup. Then, I had planned on Leechburg-Riverview. But, with the rain reeking havoc on the evening, I aimed for close. Especially when Leechburg moved kickoff up to 6:30pm. After the long night on Thursday, I didn’t want to drive far and chose to forego my plans and just take in one of the 5:30pm local games. Greenville-Hickory, Reynolds-Maplewood, Sharon-Sharpsville or West Middlesex-Cochranton. Getting a bit of a late start, I could’ve driven to Fort LeBoeuf for their 8pm game against Franklin. But, instead, chose to head to Reynolds. Getting slammed by rain on the run to the car, I was drenched head-to-toe. The grass field where most were parked turned to a muddy slip-n-slide. I relocated my car to pavement and waited out the nearly 2 hour delay. The game itself was a tale of two halves. Before and after the delay. Reynolds had just scored their third touchdown of the first quarter to make it 18-7, pending the PAT. And then, including returning the kickoff for a TD, Maplewood would go on to tack on two more touchdowns to take the game. The next day, Saturday, was a mess of planning. There were so many different options with the delayed and postponed games. Original plans called for my first trip back to District 6 in several seasons. An afternoon stop at Conemaugh Valley and a night game at Claysburg-Kimmel. However, with another late night, waking up for the nearly 3 hour drive wasn’t exactly what I had in mind. But, there were options. Conneaut hosted General McLane at 1, Meadville hosted Warren at 4, and McDowell hosted Cathedral Prep at 7. Even just two would work. 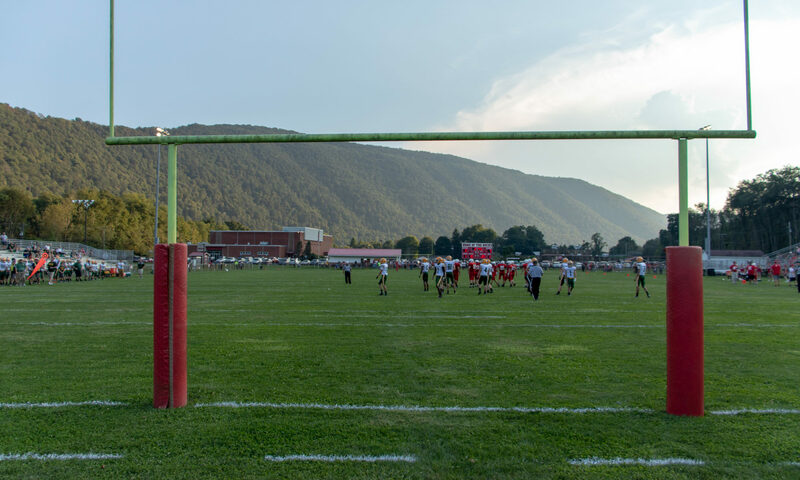 Corry also hosted a 1pm game against Titusville, while Kane hosted Punxsutawney at 4:30pm. Over in Ohio, Canton South hosted Salem at 4, which would matchup with a noon kickoff in Akron. Even a night game in Warren. Ursuline-Harding was kicking off at 1, as well. So, then I looked to New York and saw that they had some rescheduling as well. Section 6, where I had planned to attend when plotting out my season at Niagara Falls and Orchard Park, had a 10am completion of CSP and Salamanca. And Chautauqua Lake’s homecoming game was pushed back to Saturday at 6pm. This gave me two options. I’d travel northeast to Corry for their 1pm homecoming game against Titusville. And have two options. Kane-Punxsutawney at 4:30 about an hour away, or Chautauqua Lake/Westfield-Randolph/Frewsburg at 6pm about a half hour away. This game was moving fast. Both teams heavily relied on the run, and it was eating the clock. It wasn’t until a 4th down that Titusville broke open the scoring with a 30-yard pass to a wide open receiver down the left side. Corry threatened throughout the second quarter, including a fumble into the endzone for a turnover. Then, with seconds remaining, the Beavers’ punched it in from a yard out, combined with the two-point try, took an 8-6 lead at the half. That’s all they’d need as neither side could score in the second half on a cool, cloudy afternoon. The problem then, was what to do next. The Corry game finished with about 75 minutes before the kickoff at Kane. But, I’ve been to Kane when they hosted Sheffield in the AML Championship several years earlier. And it’d mean no stopping for food, etc before the next kickoff. And barely making it before the next kickoff. Or, I could head to New York. With a fail safe of heading to Orchard Park or Erie for a 7pm game. But, everything indicated Chautauqua Lake’s game was still on for 6pm. It also gave me some leisure travel through southwest New York. As I’ve pointed out in the past, is that New York’s NYSPHSAA has a rather embracing policy of co-ops. Something which Ohio is entirely opposed and much more ‘public’ about it than Pennsylvania. In PA, where a co-op only gets listed by the ‘host’ school, except in cases where the school itself wants to make it known, such as USO in Pittsburgh, or the two District 9 co-ops: Union/ACV or Ridgway/Johnsonburg, the state still only recognizes the host, officially. In New York, as I had pointed out a few weeks earlier, lists all teams in the co-op. Including CSP, which is the three small schools in the far southwest corner of the state. That brings us to Saturday Night’s game. Chautauqua Lake/Westfield is a co-op between the two schools. For several years, Chautauqua Lake had formed a co-op with Maple Grove, located at the far end of their namesake lake. However, Maple Grove had seen enough enrollment growth to operate a team independently. This meant that Chautauqua Lake was in search of a new partner. Westfield, located along Lake Erie and the New York Thruway had previously co-oped with Brocton, a few miles up the lakeshore. Brocton, though, had now co-oped with Fredonia. This left Westfield too small to form a class D team, but would be in search of a partner. So, Chautauqua Lake and Westfield combined to form Chautauqua Lake/Westfield. With games hosted at Chautauqua Lake’s campus in Mayville. A small, modern, stadium located behind the school on the hill northwest of town. Their opponent was Randolph/Frewsburg. Randolph was three-time state champions in Class D just recently, but numbers had dropped since. And Frewsburg, the Bears, were on the verge of cancelling their 2017 season. An emergency co-op was granted between Randolph and Frewsburg to get through the year. The partnership has continued. IT has bumped them up to Class C. Which has left Class D with only 4 teams in the latest cycle. Unlike other co-ops, both teams in this matchup kept their nicknames. When Chautauqua Lake and Maple Grove co-oped, the MGCL Thunder Dragons were born out of the Thunderbirds and Red Dragons nicknames. However, Westfield had no bearing on Chautauqua Lake’s uniforms, nickname, etc. Randolph remained the Cardinals, but with the left side of their helmet having a black F blazoned across it rather than another red R.
Despite the Cardinals being clearly the better team, the Thunderbirds kept it interesting through the first twelve minutes. But little things kept them from being able to really step up and compete. 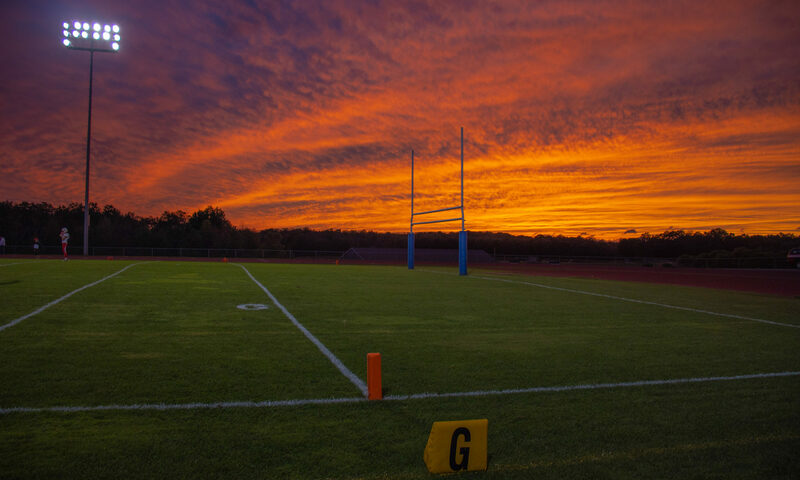 Halftime offered one of the most picturesque sunsets I’ve seen at a game (pictured above). Combined with the stadium on a hill with a clear view of the west, the clouds, and being a few miles east of Lake Erie providing an excellent mirror, the underside of the clouds lit up like a surrealist painting. But, over time, even Chautauqua Lake’s fourth quarter TD wasn’t enough to really make a dent in Randolph’s lead. The Cardinals held off the remaining 8:30 and won easily, 41-19. The stadium itself in Mayville may be small, but one of the nicest ones you’ll find. Concrete with entry from the top. The two-story concession/restroom building includes a maintenance building on the first floor at track level. This creates a balcony that looks out over the field on both ends of the building. Complete with picnic tables on the raised platform for those to eat at before returning to their seats. This seemed to be a favored place for fans to mingle during the game. The visiting fans had a very small bleacher set up beyond the far side of the track.With no formal separation between the stands and the field other than walking across the track. In addition to this game and the final three quarters of CSP-Salamanca being postponed, the Maple Grove-Cattaraugus-Little Valley game is scheduled for Monday at 5:30pm. Monday, therefore, included a trip north once again to Bemus Point. A spot on the map I know well with several trips over NY17 and now I-86 over Chautauqua Lake. After taking in a game at the north end of the lake on Saturday, it was now time for a game on the southern end. Maple Grove is located on a hill overlooking the lake. A small sliver of which is visible from the home stands. Maple Grove Stadium (not Field), as it’s called in the program, is entirely concrete poured on the hillside south of the high school. Included are two soccer fields, above and behind the stadium and at the east end level with the football field. Catt/Little Valley, as they’re nicknamed, came out overpowered by the Maple Grove offense. Two quick touchdowns set the tone for the game. The Timberwolves managed a few good plays and scored a TD, but were quickly treading uphill. A light sprinkle of rain in the second half, combined with the high winds amplified by the location on the hillside made the fans huddled and muted. A one-sided game didn’t help. The two soccer games that were running at the same time on the adjacent fields also helped thin the crowd. Both Boys and Girls soccer games against Pine Valley AND Boys and Girls Modified Soccer games were going on one after another. Admissions was free for all the games, and fans could mingle from one field to the other depending on what they wanted to see. The only problem was that the late start times on the adjacent fields meant darkness enveloped those other games and made watching them very difficult. Like the famed Homer in the Gloamin’, a huge cheer erupted from the adjoining soccer field where the Maple Grove’s girls team (regular or modified, I wasn’t sure) scored the winning goal with 4 seconds left in the game in near total darkness. They won, 3-2. A few of their fans meandered over to the football field. While some went over to the boys game taking place at the other field. Being a Class D team in NY, these are small schools. Yet, Maple Grove had a great old concrete stadium. And a decent, albeit small, supportive crowd for a rescheduled Monday homecoming game going up against four other games. The Red Dragons had previously played as a co-op with Chautauqua Lake, the team I saw Saturday night. The “Thunder Dragons” as they were called as a combination of Thunderbirds and Red Dragons, were perennial powers. However, with numbers improving, Maple Grove jettisoned their co-op partner and are now playing solo. Cattaraugus-Little Valley, however, is not a co-op. But, it is a consolidation of the two schools in the two towns of Cattaraugus and Little Valley. The two towns are only 6.7 miles apart. Along with the triple co-op of Clymer/Sherman/Panama and Salamanca, these four schools make up all of Section 6 Class D. Due to so many co-ops bumping teams higher up, the four-team Class will play a double round-robin schedule with two inter-class games. Unlike other classes, they play an 8-week season instead of 7 weeks. And, all four teams will automatically enter the Class D semifinals. The winners will play at New Era Field in Orchard Park for the Class D championship. Despite New York only playing a 7 game regular season schedule, virtually every team can play a post-season game. Either in the sectional tournament OR in a post-season at-large tournament. Those games were usually played on a Wednesday or Thursday night. Section 6 will host all five sectional finals at New Era Field over two days in what would be the first weekend in November. For more photos of this week, click HERE.